My great Aunt Virginia Lee Ijames b: 05 Jan 1895. Owensboro, Daviess, Kentucky. 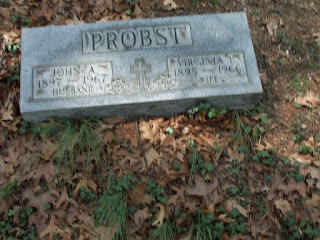 Married John Adam Probst 25 Mar 1925. d: 24 June 1966 in Louisville, Jefferson County, Kentucky. I never had the opportunity to meet her but from what I understand, she was quite a lady. She was a chef on ships. I finally found her in the 1930 "Crew of Vessels" Pittsburgh, PA Census Report, I did the happy dance! This photo which a genealogy friend, Rachel found for me, I cannot take credit for and the Census report I found are the only two items I have for her. My Aunt Virginia located a few photos of her recently, now I know what she looked like, (another post). I am slowly learning more about her. My Aunt Virginia and I were named after her. My Great Great Grandfather and Grandmother - John Henry TABELING b: 4 Dec. 1832, Born in Prussia, Germany, d. 1 Aug. 1883. Augusta b. 16 Feb 1841 in Prussia, Germany, d. 1898. Settled in the little towns of McQuady and Cloverport, Kentucky. They are buried in the old "Old St. Mary of the Woods" cemetery in McQuady, KY. It's an old cemetery that was not taken care of and overgrown with weeds. Old St. Mary of the Woods Catholic Church just down the road is now caring for it and it's such a beautiful little cemetery. I still have a lot of research to do on their lives. I have limited information but have found them both in an 1880 Census. With the help of Mary Ruth Bye and Karen Schafer (Karen is an Archivist for the Hardinsburg Court house) led me to Sister Mary Agnes at the Old St. Mary of the Woods Catholic Church. I called Sister Mary Agnes and she was so helpful, we exchanged email addresses. She said that when we arrive there, to find her and she would help us. Our family drove from CA to KY last April to meet my Aunt Virginia, we then rented a van and all drove about an hour and a half from Louisville and hunted for this cemetery. When we arrived at the church, I found Sister Mary Agnes who was more than happy to guide us. She hopped in the van and took us to the cemetery that was down this little one lane road and back behind trees. There is a new "Old St. Mary of the Woods" cemetery right across from the church, that cemetery also holds several of my TABELING ancestors. The church is very historic and my ancestors were regular parishioners (another post on the history of the church later). This was my first Genealogy trip and a great start towards research on my TABELING line. Photo Privately held by Gini Webb (address for private use). I had every intention of posting yesterday...I opened up my laptop, logged on and then life got crazy around the house. Working full time, my weekends are attempting to catch up and getting ready for the new work week! My daughter and two grandchildren are living with us temporarily and along with that are two cats, at the moment two dogs (she is babysitting a friends dog). Our dog Koda was sick and ended up at the vet and our grandson Ethan wasn't feeling well so he was at the Dr.'s! We were all running around like crazy people, laundry, grocery shopping and on and on! Needless to say there just is not enough time to get it all done. My original post was going to be about our Neighborhood. We had dinner with our dear friends and neighbors Claire and Brian last night After dinner we watched a movie just hung out... which brings me to my point: We live in a cul-de-sac and have a wonderful neighborhood. We have been living in our home now close to 21 years. My daughter grew up here and now my grandchildren are growing up here. In the past we have tried to get together regularly with all the neighbors (about 7 or 8 families). We will all put our chairs in the center, pull out the BBQ's and hang out, catch up and have a great time. The kids can run around the neighborhood, play and be safe. We watch out for each other and help each other out. When someone needs something, one of us is their to help. When we had the Cedar Fires, we all really pulled together and stuck together at our local Wal-Mart parking lot in our Motor homes. It's a great neighborhood to live in and to have all of our kids grow up in. When one of our descendants decide to pursue and continue our family history (I am pretty sure I have my granddaughter hooked, I am getting her started! ), census reports will reflect all our great neighbors and they will remember our good times and wonderful memories. Now I understand why its a good idea to check into the neighbors on census reports to learn more about our Ancestors. This is my first post and I am excited, it took me a long time to get the nerve up to do it! Had it not been for Mysteri at Heritage Happens and all of her help and support I would still be checking out everyone else's blog and staying behind the lines...Thank you Mysteri for everything, you have helped me more than you know! A little about myself: My given name is Virginia, my nickname is "Gini" pronounced Jeannie. It really came in handy for my blog title and other areas of Genealogy! I was born in Germany and came here by ship when I was 3, I have alot of wonderful family history. I have only been doing Genealogy for about a year and am very new to blogs, only a few months. I have alot to learn and am very excited about it. I am looking forward to retirement so that I can spend as much time on researching, and blogging as I want! It will be hard to keep up with all the genea-bloggers, I work full time and have a pretty busy life so I may not be able to post daily, it will be fun trying though! My direct lines are: IJAMES/EIMES (my grandfather changed the spelling! ), HAF, SAULE, JARBOE, TABELING. On the Eimes side we have gone back to 1120 with the help of a relative in Ohio: Roberta Iiames, she has been an incredible source. I have come along way in just a year and I know it's going to be an exciting journey ahead. 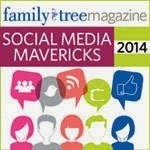 I look forward to hopefully being a part of the Genealogy Blog world!